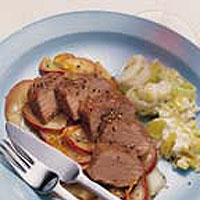 A deliciously easy recipe using tender New Zealand lamb, with apples and a citrus twist to give it a fruity flavour. Creamy leeks make the perfect accompaniment. Arrange the apple slices in the centre of a shallow ovenproof dish and pour the orange juice with the orange rind over the top. Place the lamb fillet on top of the apples and season well. Heat the marmalade either in a bain-marie or in a microwave on full power for 1 minute or until runny, then brush over the lamb. Place in a preheated oven 200°C, gas mark 6 for 20 minutes. Melt the butter in a frying pan then add the leeks and sauté gently for 10-15 minutes. Reduce the heat then stir in the crème fraîche with the nutmeg, season to taste and continue to cook over a low heat for 1 minute or until heated through. When the lamb is cooked, remove from the oven and allow to rest for 2-3 minutes. Place the lamb on a chopping board and cut into thick slices. Divide the apple between 2 plates and arrange the lamb on top. Drizzle a little of any remaining orange juice from the dish around the lamb. Serve immediately with the creamy leeks and mashed potato.